Have I Been Pwned: Why 1Password? I had my epiphany about the importance of creating secure passwords (and the necessity for a password manager) back in 2011 where I concluded that the only secure password is the one you can’t remember. Back then, I chose 1Password because it was the best fit for my needs; it was user friendly, it had clients for all the devices I used and it made syncing my passwords across them simple. 7 years and hundreds of passwords later, I partnered with them to help people who find themselves in a breach after searching HIBP get themselves into a great password manager. 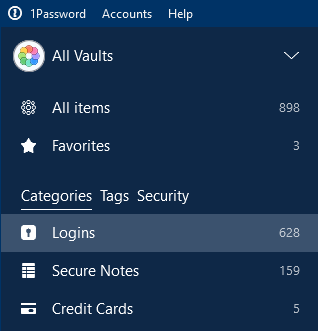 Today, I use 1Password in all the same ways as I have since 2011, and more. I obviously use it for every single one of my passwords, but I also store other essential information in there such as driver's licence, memberships and credit card data. I fill payment forms on web pages with the latter and use the same keyboard shortcut to fill in identity data such as my phone number and home address. Shortly before the partnership came into being, I subscribed to 1Password families so that my wife and I could share important sensitive information between us in a secure, practical fashion. I'm often asked how I feel about syncing my passwords via 1Password's online service, to which I have 2 responses: Firstly, I need a sync service. I regularly use several different devices and when I sign up to a service on say, my PC, I also want access to the credentials on my iPhone. Plus, I want the ability to securely share secrets with family so there needs to be a sync service and they've designed a really solid way of doing this. Secondly, I point people who want to understand more to the 1Password security model and if they really want to get down into the details, to their whitepaper on the 1Password security design. It goes as deep as you want to go in terms of detail but the big things for me are the fact that they can never see any of my stored passwords, that even if someone got my master password they'd still need a separate "secret key" to gain access to anything sensitive and that they offer two-factor authentication which is required to set up 1Password on any new device. Get 1Password and get secure! I've lived with 1Password day-in and day-out for years now and I've stuck with them for the reasons mentioned here. This is why I'm recommending 1Password on HIBP - because it's the one both my family and I use and it's the best possible thing you can do to improve your online security!